Schools across Shropshire are being encouraged to follow the example of Oxon C of E Primary School in Shrewsbury and increase the amount of their waste that is recycled – whilst at the same time helping a charity get local people into work. Photo shows (from left to right): Cllr Peter Adams (also a School Governor); School Head, Mark Rogers; Cllr Nick Bardsley, Trustee of Cae Post and Glyn Lewis, Cae Post vehicle driver. 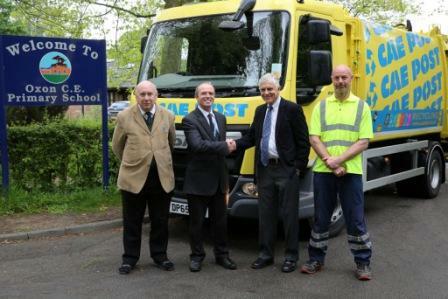 Waste from Oxon C of E Primary School in Racecourse Lane, Shrewsbury, is collected weekly by Cae Post, a local social enterprise based in Trewern, near Welshpool, which exists to encourage recycling and help disadvantaged people into work. Mark Rogers, Head at Oxon Primary School, said: “As a school with a caring ethos at its heart, we are proud to be working with Cae Post, as it helps them provide meaningful employment to disadvantaged people. Cae Post is an innovative social enterprise based in Powys, providing waste management and recycling services across mid-Wales and North Shropshire. As a social enterprise, the income generated from its business is used to fulfil its objectives to give more people a chance to be part of the working world. Nick Bardsley, a Shropshire Councillor and Trustee of Cae Post, said: “Cae Post has been involved in providing opportunities to disadvantaged people and promoting environmental awareness for over 30 years. “There are nowhere near enough places in Shropshire and Mid Wales where people who find it difficult to get work can get training and meaningful employment. Cae Post is an asset to Shropshire as well as Powys. Cae Post is keen to encourage more schools in Shropshire to get in touch and arrange a visit to their plant to give pupils a better understanding of the importance of recycling and waste management. This entry was posted in Cae Post, Charity, News, Social enterprise and tagged Cae Post, Charity, recycling, Shropshire, social enterprise, Welshpool on June 1, 2016 by Ethos public relations news.